Contains "floating"/"commonplace" stanzas also to be found in "Buffalo Skinners" and "Diamond Joe" (both covered by Bob Dylan). A Kelly Harrell variant ("My Name Is John Johannah") is mentioned by Dylan in "For Dave Glover" and was most likely a part of his early repertoire (no recording in circulation). "My Name Is John Johannah" shares the tune with Clarence "Tom" Ashley's "Maggie Walker Blues," which is a most likely source for Dylan's "Long Time Gone." The recitation following the third verse of Version No. 1 is a likely source for Dylan's "East Orange, New Jersey" monologue. at my DOC WATSON/WOODY GUTHRIE/ALMANAC SINGERS site. No. 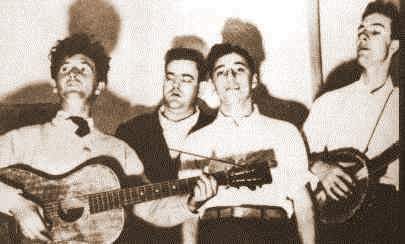 167 in Alan Lomax, The Folksongs of North America, Garden City, NY, 1960. My name is Charlie Brennan, from Charlestown I come. But I never knew what mis'ry was till I came to Arkansas. I dodged behind the depot, to duck that blizzard wind. His hair hung down in rat-tails on his long and lantern jaw. He invited me to his hotel, the best in Arkansas. Where pity and starvation was seen in every face. But he charged me half a dollar in the state of Arkansas. "Mister, I'm quittin' this job. I want to be paid off." He says to me, "All right, son." And he handed me a mink skin. So I took it into a saloon to see if I could get a pint of whisky. Put my mink skin on the bar, and be durned if the bartender didn't slip me that pint. Got drunk as old Abraham Linkern when I left old Arkansas. And said, "Mr. Brennan, remember me when you leave old Arkansas." Fare thee well to sage and sassafras tea and corn-dodger pills. It will be through a telescope from here to Arkansas. O now I am a railroad man at a dollar and a half a day. Farewell to hog and hominy in the state of Arkansas. I've traveled this wide world over, some ups and downs I've had. But I never knew what mis'ry was till I hit old Arkansas. I landed in St. Louis with ten dollars and no more. I read the daily papers till both my eyes were sore. Ten thousand men were wanted in the State of Arkansas. I wiped my eyes with great surprise when I read this happy news. And straight off I went to see the agent, Billy Hughes. To ride upon the railroad to the State of Arkansas." I started off next morning at a quarter after five. And I got drunk as a boiled owl when I left for Arkansas. I landed in Ft. Smith on a sultry afternoon. But I got off to see what was in the state of Arkansas. I dodged behind the depot, to duck the oven wind. There I met a walking skeleton, his name was James T. Glynn. His hair hung down in rat-tails o'er his long and lantern jaw. Invited me to his hotel, "the best in Arkansas." I followed my conductor into his dwelling place. There mis'ry and starvation could be seen in ev'ry face. But he charged me a half a dollar in the State of Arkansas. I started off next morning, in a hard and driving rain. You'll find yourself a different man when you leave old Arkansas." Till my teeth began to loosen and my knees began to knock. And, indeed I was a different man when I left old Arkansas. Farewell to sage and sassafras and corn-dodger pills. But it'll be through a telescope, from Hell to Arkansas.